A Cliftonville Tesco merchandiser who has been in remission from breast cancer for six years is to take on the London Marathon. Sue Miller, 55, aims to complete the 26,2 mile run to raise funds for the Cancer Research charity. It is the second marathon route for the Margate mum-of-three who completed the Brighton Marathon three years ago in a time of five hours and two minutes. Sue said: “The Brighton Marathon three years ago was my first and was going to be my last. But the London Marathon has always been on my bucket list. I had tried to get a place in the ballot but this year our community champion Julie Wicker contacted head office and they got me a place. “I’m training by running a couple of times a week and a long run at the weekend and going to the gym. “I’d really like to shave that two minutes off my Brighton marathon time for this one. One of the reasons I am running is our store has been affected by cancer a lot. 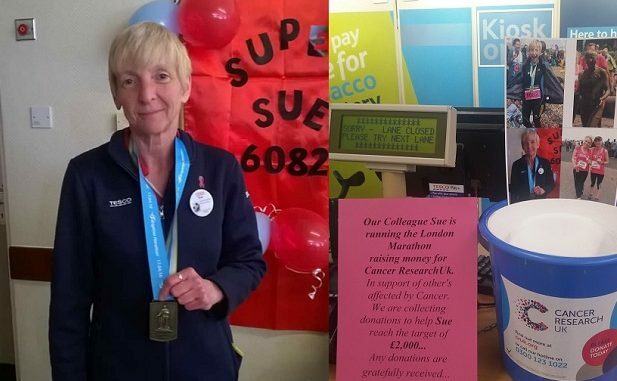 Sue has a minimum £2,000 target and has already raised £615 online and more through buckets at the store and fundraisers. More fundraisers are on the way with a Margate Tesco vs Westwood Tesco football match at Margate FC;s Hartsdown ground on Easter Sunday. Kick off is at 5pm, with an Easter egg hunt to follow. All welcome. There will also be a quiz at Lesters pub in Ramsgate Road on April 12 from 7.30pm. Teams of up to six, cost $5 per person. Call Sue on 07766 311627 or Julie on 07923 091335. Donations and sponsorship can also be made at the Northdown Road store.